The reason this is so important is that many Pastors teach that because the Jews didn’t accept Jesus as their Messiah, and because they did not fulfill God’s requirements in verse 24; then they must be given more time to do it, which they teach will happen during the supposed 7-year tribulation period. Let’s look at the purposes for the 70th week of Daniel, to see that it’s impossible for the Jews, or anyone, to fulfill the demands. You will see that only Messiah the Prince, the Lamb of God, could fulfill them; which invalidates Pastors argument that the Jews will do it. Before we go through these purposes to see how Christ fulfilled them, let’s look at the proper context. Solomon worshiped the false gods of his foreign wives, which caused God to split the kingdom in two, the House of Israel and the House of Judah. The northern House of Israel fell into worshiping the false gods of the Assyrians, so God caused the Assyrians to attack and scatter them. The southern House of Judah (the Jews) fell into worshiping the false gods of the Babylonians, so God caused the Babylonians to kill those who resisted, and take captive those who cooperated. They were in captivity for 70 years, which is when the 70 weeks of Daniel prophecy was given. Through all of these calamities, there was always a faithful remnant who believed in God by faith, such as Daniel and Isaiah. So now God was giving the Jews 490 years to reconcile with Him and accept their coming Messiah. God had punished them for 70 years, but His compassion caused Him to give them 490 years to reconcile with Him. The simple context of the 70th week of Daniel is that the coming Messiah would offer salvation through the New Covenant to the House of Israel and the House of Judah. Those that rejected Him as their Messiah would be lost in their sins, and they would be desolated at the hands of the Roman army. 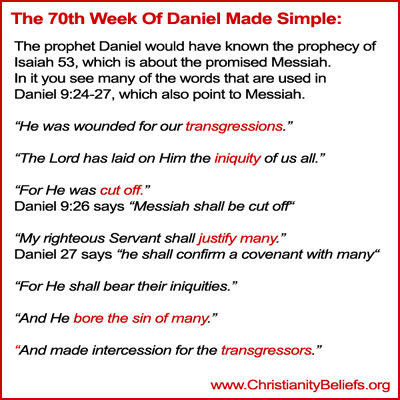 Here’s the purposes of the 70th weeks of Daniel prophecy that are given in Daniel 9:24. The prophet Daniel would have known the writings of Isaiah, and when you read Isaiah 53, which is a prophecy about the coming Messiah, you see many of the words that are used in Daniel 9:24-27, which also point to Jesus Christ. And He bore the sin of many. A remnant of Jews returned to rebuild the temple and the city, but a majority did not repent of their sins and stayed in Babylon even after they were set free. During his ministry, most of them rejected Jesus as their promised Messiah. This was fulfilled after the New Covenant was preached to the Jews for 7 years, then after Stephen was stoned to death, the message of the Gospel went to the nations (Gentiles). Thus we see that the “thy people” of Daniel 9 24 included the very ones who were responsible for the death of their Messiah. The National transgression was complete. Let’s now look at how Christ fulfilled the demand to finish the transgression. To make an end of sins. No man can stop sinning, so it’s impossible that the Jews could make an end of sins. Let’s now look at how Christ made an end of sins. To make reconciliation for iniquity. No man can make reconciliation for their sins, so this can’t apply to the Jews, only to our Savior. Reconciliation for iniquity was accomplished by the sacrificial death of Christ as the Lamb of God. No man could ever bring in everlasting righteousness, so this can’t apply to the Jews, only to our Savior. Everlasting righteousness was what our Lord manifested in His sinless life, and by His life, death, and resurrection, Christ has made everlasting righteousness available to all who accept it by faith. To seal up the vision and prophecy. Man cannot seal up the vision or prophecy, so this can’t apply to the Jews. The Mosaic Law and covenant pointed to Jesus. He sealed them up, that is, he accomplished them, answered to them to a tittle; all things that were written in the law, the prophets, and the psalms, concerning the Messiah, were fulfilled in him. Only God can anoint the Most Holy. The returning Jews rebuilt the temple, but it was never anointed by God, the Ark of the Covenant was never placed there, and God’s presence didn’t fill the temple. Jesus fulfilled this when He came in the flesh and our High Priest was anointed. In summary: All six of these purposes were fulfilled during the 70th week of Daniel. Jesus has fulfilled everything that He commanded the Jews to do. Very nice interpretation indeed..!! But one thing to ask, 70 weeks are in three categories 7×7, 62×7, 1×7 according to Daniel (NIV), right now 1×7 is not yet fulfilled ( tribulation period). My question is, if all the 6 events ( Dan 9:24) is already fulfilled accord to your explanation, what will be fulfilling in tribulation i.e the last 1×7 week? We should appreciate the completeness of God Himself. In order to add to the spiritual God made the physical and God Himself became physical. Obviously God loves the physical.The Son and the Holy Spirit are manifestations of God. However, they are complete and perfect because they are God Himself. God made the angels first, then begot Jesus the bridge and then humans. God is expanding the universe with His creation. There is the teaching that Adam was perfect and brought sin into the world and Jesus was perfect and redeemed us. However, how could Jesus pay the price of all of our sins just because He is perfect and innocent? Didn’t He have to be God to pay this enormous cost? Scripture clearly says that Adam sinned and therefore the whole human race was sinful from birth; and that Messiah was sinless, and was our Passover Lamb to pay for our sins. Thank you so much for your information. It has been a source of comfort to me as I study so many other teachings. So many conflicting opinions and it makes for doubt. But the majority sought to fulfill the law out of their flesh and they always failed, for “flesh and blood cannot inherit the kingdom of God” 1 Corinthians 15:50 this makes sense but there are people who should know better who think this means literally. Could the great falling away really be a good thing because people are coming out of false religions? I hope that you are correct, that the time of tribulation is not seven or three and half years but a brief time. Then Jesus comes, He brings His Kingdom which is the New Jerusalem, Heaven and Earth are united as it was intended. With His coming the dead are risen and the millennial reign begins. Is that what you think? What you have written makes sense, shouldn’t all this make sense, since God is a God of order. Yes Suzanne, that seems to be the sequence that Revelation lays out. It doesn’t really give a length to the time of tribulation in the end times. I think that things will happen quickly. Marantha Messiah! thanks so much for your website which helps me to study more and more interesting.